Can you remember any birding movie before Schrodinger’s Cat? Probably not. For me, the only “birding” movie that I knew of were the Dogs of War (1980). 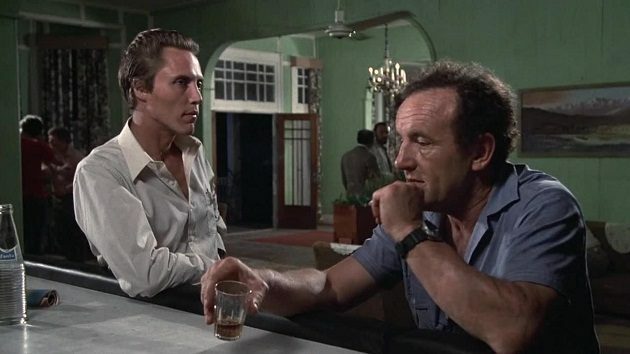 If you are not familiar with the story, it’s about an Anglo-Irish mercenary, Jamie Shannon (played by Christopher Walken), hired to overthrow the regime in a fictional Western African country (it was actually filmed in Belize, Central America) and prior to the real thing, he was doing a reconnaissance trip posing as a “rare birds photographer”. I knew about the movie since my early birding days although it was more than ten years later before I saw it. Then, how did I know about it? After the Dogs of War was aired on state TV in the late 1980s, a friend of mine, found observing birds nesting on electricity pylons in a breadbasket country north of Belgrade, was taken to the police under suspicion of espionage. He may have been looking for the best way to sabotage a power supply, right? Technically, it was a possibility, but if that was the case, he would never defend a PhD thesis on birds breeding along the high voltage powerlines in a treeless agricultural landscape. What made the story better (and a worse experience for him) was the fact that the cops had seen the Dogs of War. And they knew that “birders” were highly suspicious characters. In the bar scene (24th minute of the movie), local chief of police asks Shannon for the scientific name of a Great Crested Grebe, because President Kimba shares his interest in “our native birds”. Out of all those truly magnificent African birds, he asks for something that lives mostly in Eurasia, but also Australia and the very southern tip of Africa. You noticed it: it doesn’t even live in Western Africa at all! Still, knowing his Latin names well, Jamie Shannon stayed alive. When my friend, Slobodan Puzovic, was taken to the local police station in Serbia, the cops took his field guide and actually asked him to tell them the scientific names of various birds. In real life! At first, Puzovic gave correct answers, but after a while found the situation amusing and deliberately started to fail. Still, at the time he was working in the Natural History Museum of Belgrade, so he was quickly cleared of espionage suspicion. Finally, the Schrodinger’s Cat is, of course, The Big Year (2011). While fun to watch, one tends to forget it the moment it’s over. It is not a bad movie, but calling it a good one would be far outstretched. It is one of those movies that are both dead and alive at the same time. What a great story, thank you!